NEW YORK – October 14, 2013 – Afterlife with Archie, the brand new ongoing series written by Harvey award winning writer Roberto Aguirre-Sacasa (Stephen King’s The Stand) and Eisner award winning artist Francesco Francavilla (Black Beetle) sold out in less than 5 hours at Diamond and will be immediately going back for a 2nd printing. The highly anticipated horror series dominated New York Comic Con and has received rave reviews from notable comic and news sites including THE ASSOCIATED PRESS, USA TODAY, HUFFINGTON POST, FANGORIA MAGAZINE, IGN, COMIC BOOK RESOURCES, NEWSARAMA, BLEEDING COOL, BLOODY DISGUSTING and many more. 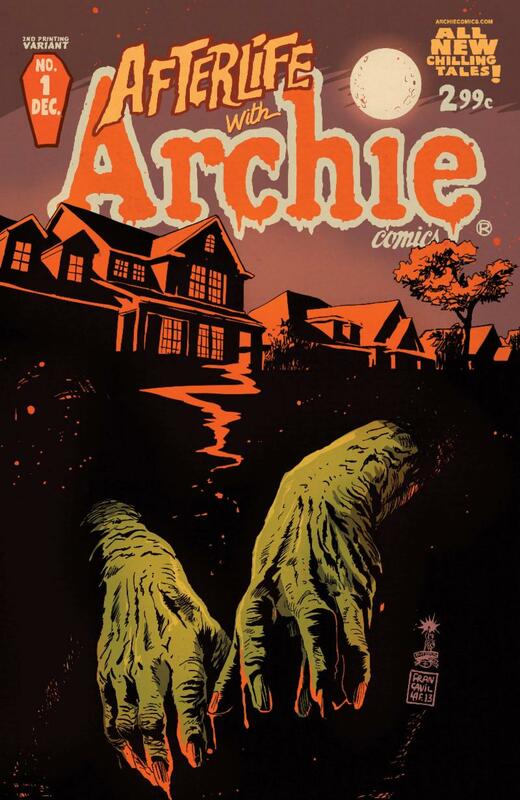 Series artist Francavilla created a special cover for the 2nd printing of Afterlife With Archie #1. The debut issue was the fastest selling Archie comic of all time and is Archie’s first direct market only series ever, taking the Archie characters in a dark, horror inspired direction. **Archie Comics urges consumers to order Afterlife With Archie #1 and future issues through their local comic shop as the series has already generated buzz from all corners of the media and will continue to do so in the coming months with more sold out issues anticipated.